When Wayne Simmonds sees the ball drop on his second annual charity hockey event this Saturday, he’ll notice plenty of smiling faces and the same love for the game that he continues to excel at. Started in 2012, the event known as Wayne’s Road Hockey Warriors (WRHW) was designed to support kids in the city of Scarborough, Ontario, just a short drive east of downtown Toronto. The WRHW tournament gives kids ages 8-12 the chance to participate in a sport they may not have had the opportunity to play before. In the spirit of Simmonds’ event, the NHLPA Goals & Dreams Fund is jumping on-board in support, donating 25 full-sets of hockey equipment to youth hockey programs in Scarborough, the place that gave Simmonds his start in the game. Playing the game since he was five, Simmonds wanted to reciprocate the support he received as a kid from the local hockey community. The 24-year-old has used those words to good effect. Simmonds has become one of hockey’s premier power forwards, a hard-hitting player with a soft touch around the net. And, despite an off-ice demeanor that suggests quite the opposite, Simmonds is nothing short of intense when he steps on the ice. “He’s a pretty quiet, soft-spoken guy,” said former Philadelphia Flyers’ teammate, Daniel Briere. “But you know once the game starts, Wayne is going to be amped up and ready to go. 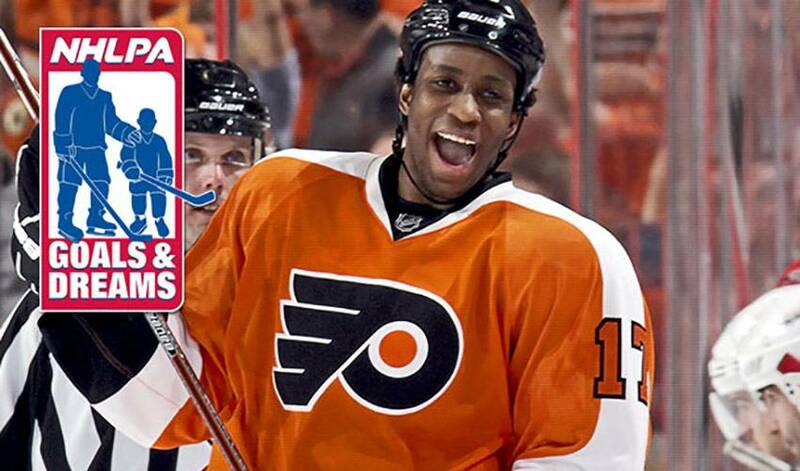 Simmonds will have to wait a bit before he gets to put his skills on show for the 2013-14 NHL season. For now, he’ll enjoy the game in a much different way than he’s accustomed to. He’ll also have some familiar faces lending their support at the Road Hockey Warriors tournament, including Drew Doughty and Joel Ward, along with siblings, Chris and Anthony Stewart. “I didn’t even get to finish the question when I called up to ask if they wanted to join us,” laughed Simmonds. “It’s nice to know you can count on the guys. And what will he leave them with? How could they not when they have Wayne Simmonds in their corner? For more on the Wayne’s Road Hockey Warriors event, click here.